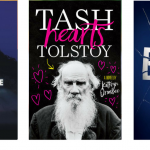 Tash Zelenka is head-over-heels in love with Leo Tolstoy. She channels her passion and her prodigious snark into the Web series she creates with her best friend Jack, a modern adaptation of Anna Karenina called Unhappy Families, which boasts a modest following. When a famous Internet personality gives their series a shoutout online, Unhappy Families experiences sudden overnight fame, resulting in overwhelming helpings of accolades, inevitable trolls, and pressure to deliver like they’ve never experienced before. To further complicate matters, Tash finds herself engaged in an intense cyber-flirtation with another well-known vlogger. The problem is that while Tash knows perfectly well how to express her love for Tolstoy, she is less sure about how to articulate her feelings towards boys. She identifies as romantic asexual, a fact which she has a hard time talking about with the people closest to her, let alone a guy she has never met before. It doesn’t take long for tensions to develop between her and her best friends, one of whom has been nursing an unrequited crush on her for a long time. Tash and her friends’ whip-smart, snappy banter will quickly draw readers into their orbit, making their story accessible to readers who have zero familiarity with Tolstoy’s repertoire. Tash and Jack, the two best friends at the heart of the novel, are both refreshingly flawed and relatable. Their wise-cracking dialogue is often hilarious, propelling readers headlong into their world of inside jokes and nerdy references. The supporting cast of characters is also vibrant and well-developed, representing a variety of colorful personalities and a spectrum of sexualities. Tash’s representation is particularly noteworthy, being a both a nuanced and explicit representation of a romantic asexual character. Readers looking for nuanced representation of underrepresented, diverse sexualities will be sure to find it here, wrapped in an irreverent, earnest package that is full of humor and heart. After tough as nails teen orphan Jule befriends adopted wealthy socialite Imogen, Immie goes missing and is presumed dead. 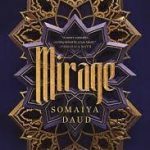 When a chameleon-like Jule takes on Imogen’s style and demeanor, some close to Immie begin to wonder if Jule is simply genuine, or a genuine fraud. Her hard-core combat skills could allude to her being an undercover agent, or a criminal… a protective best friend, or a conspirator. The unconventional reverse chronological order totally works in this novel, which begins with Chapter Eighteen. Readers become instantly absorbed in Jule’s jet-setting itinerary, flying through the twisty, suspenseful pages, itching to know what facilitated her actions. The striking cover catches the eye and gives a hint as to the intriguing premise of the book. Issues such as adoption, religious diversity, and social classes/entitlement are featured. Lockhart acknowledges the nod to Patricia Highsmith’s The Talented Mr. Ripley, while keeping her own distinct style and techniques to make this remain a very original story. Hand this one to fans of books with unreliable narrators, such as Lockhart’s We Were Liars, Allegedly by Tiffany L. Jackson, The Adoration of Jenna Fox by Mary E. Pearson, or selections by Nova Ren Suma. Have you heard of the Long Walk of the Navajo? During the Civil War, the United States Army forced Navajos off their land and families struggled to survive in the unsafe prison. Danny Blackgoat is a wanted criminal, charged with stealing a horse from Fort Davis. In the 1860s, the penalty for horse theft is death by hanging. Danny’s old friend, Jim Davis, stole the horse to help Danny escape. Danny must choose to help his friend or remain free. Readers will find the story of Danny Blackgoat an easy to read adventure with a unique historical setting during the Civil War. Issues with the soldiers and their (un)justice system will remind readers of current social problems with law enforcement. Loss of family & the power of friendship will resonate with teens in foster care, group homes & juvenile justice programs. 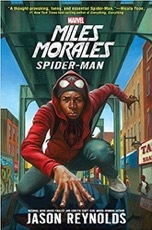 Meet Miles Morales, a half black, half Puerto Rican high school junior in Brooklyn, New York. Only his father and his best friend, Ganke, know the truth: Miles is Spider-Man. The problem is, Miles’ spidey-sense seems off. The buzzing makes it difficult to focus in class, where his teacher, Mr. Chamberlain, drones on about the “benefits” of slavery and incarceration. Miles wants to do well in school and please his parents, but he is fighting internal battles that may require him to suit up and take care of business. Kadir Nelson’s realistic skin tone rendering, use of light, and splayed out, web like fingers combine for a masterful cover that appears to have an almost three-dimensional aspect. Miles and his buddy, Korean-American Ganke, are a highly amusing character duo that will entertain readers instantly. The novel format takes nothing away from typical comic graphic representation, as Reynolds’ lifelike characters seem to breathe on the page. Strong voices emerge from multiple characters…some menacing and disturbing, others likeable yet flawed. Miles’ banter with both his father and Ganke will have reluctant readers rolling on the floor laughing from references such as gold-plated farts and bedwetting. Dialect provides an authentic feel to the narrative. Pacing intensifies as Miles comes closer to the ultimate cause behind his spidey-senses gone wild. Thought provoking and reflective, this is so much more than a superhero story with issues such as racism, poverty, and family secrets that surface, woven together seamlessly by Reynolds. The exploding conclusion lends itself to a possible sequel. Naturally, Marvel comics readers will eat this book up, but the audience range is actually much broader. 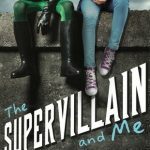 The humor, battle of good vs. evil, multicultural characters, and the superhero factor have appeal for a wide variety of readers. Teens craving more of Miles Morales can be directed to the several other Marvel comics featuring this character. Additionally, this would be a fabulous book club or classroom discussion book to encourage dialogue for tackling the issues of racism, family, internal struggles, and more. After Justyce McCallister tries to do the right thing by assisting his biracial ex-girlfriend in a parking lot, he ends up handcuffed on the ground. He then reflects upon the teachings of Dr. Martin Luther King, Jr., and begins keeping a journal of sorts with letters to Martin. When a needless shooting takes the life of someone close to him, Justyce questions whether Martin’s visions of peace are possible. The simple, yet eye-catching cover of an African-American male teen in a red hoodie sets the tone for the stereotyping that unfolds within. The believable treatment of the characters by police and others is unfortunately a ripped-from-the-headlines reality in today’s world, and many teens will be able to relate to the introspective thoughts Justyce candidly reveals in his letters to Martin. Topping out at just over 200 pages with short chapters, the content and format holds strong appeal for reluctant readers. Fans of All American Boys by Jason Reynolds, The Hate U Give by Angie Thomas, and How it Went Down by Kekla Magoon will devour this book. Dear Martin is also an outstanding choice for a classroom or a book club discussion for teens focusing on social justice, racism, and police brutality. Next Post 2017 Teens’ Top Ten Announced!